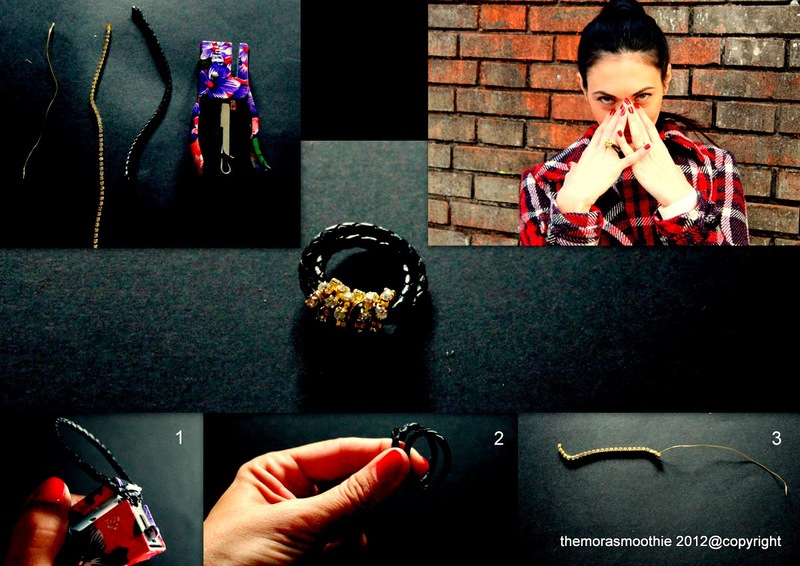 The Mora Smoothie fashion blog, DIY fashion by Paola Buonacara: DIY ring with leather and Swarovski! In today's post the tutorial about the ring I was wearing here. Making it's really super super quick and easy, and in a few time you'll have a super chic ring that will make you shine! Essential: leather cord, thread of swarovski, golden thread and stapler. Tutorial: Wrap the leather cord on your finger, creating 2 laps, take the measurement and add about half a centimeter, it will be the thickness of Swarovski. Then stops the threads with a point of stapler, finally with golden thread wrap the Swarovski and rolled the thread of the same on the double cord, covering the point of the stapler, lock the golden thread and voila your ring is ready, what about it? A big kiss and a big super soon with many new features. Nel post di oggi il tutorial dell'anello che indossavo qui. Farlo è super ma veramente super semplice e veloce, ed in poco tempo avrete un anello super chic che vi farà brillare! Materiali: cordino in pelle, filo di swarovski, filo oro e pinzatrice. Tutorial: arrotolate il cordino in pelle sul vostro dito creando 2 giri, prendete la misura ed aggiungete circa mezzo centrimetro, sarà lo spessore degli Swarovski. Dopo fermate i cordini con un punto di pinzatrice, infine con il filo oro avvolgete gli Swarovski ed arrotolate il filo degli stessi sul cordino doppio, coprendo il punto di pinzatrice, bloccate il filo oro ed voila il vostro anello è pronto, che ne dite? Un bacione grande e a super presto con tante novità. Semplicissimo e di grande effetto!